Real Madrid have been a roller coaster this season. Some games they’ve lack concentration, defensive compactness, presence in the central axis, chance creation, or accuracy in the final delivery. Contrary to their negative games, they seem to be able to put all the right pieces together in other matches. When this happens, they completely dismantle their rivals. That was the case when ‘los blancos’ hosted Sevilla at the Santiago Bernabeu for the 15th fixture of La Liga Santander. From the first whistle, Sevilla looked completely defeated. With no compactness in defense, an insanely spread out shape, narrow full-backs, an ineffective high press, and no real possession strategy, Sevilla looked like they were in for a long 90 minutes at the heart of the Spanish capital. It’s safe to say that while Real Madrid executed their possession strategy to perfection, the final score of the match was heavily influenced by Sevilla’s weak performance. Now, let’s dig deeper into what you’re really here to read: analytics on the match. Real Madrid commenced with a 4-4-2. Absent defenders Carvajal, Ramos, and Varane meant Zidane had to improvise in the back four. Hakimi, Vallejo, and Nacho filled the starters spots. As for their midfield, Casemiro was also absent. This resulted in a 4-man midfield with Lucas Vazquez and Asensio out wide. As for the visiting team, they aligned a 4-5-1/4-1-4-1 with Carole and Mercado as full-backs. Banega and Vazquez played in front of Pizarro, while Muriel started for in-form Wissam Ben Yedder. Curiously enough, Sevilla’s most consistent player this season (aside from Lenglet and Banega) started on the bench: Pablo Sarabria. About 90% of the action occurred during the first 45 minutes of the match. Real Madrid’s possessions created trouble from the first second, therefore Zidane made no modification to their strategy throughout the whole match. Below, an image explanation of Real Madrid’s strategy when in possession. As the images show, Real Madrid conducted a vastly spread out build-up when playing out of the back. This made Sevilla’s high press basically non-existent. The more distance between Real Madrid players, the more space Sevilla had to cover. Upon overcoming Sevilla’s high press (they easily did so nearly every time), Real Madrid looked to transition directly towards the opposition goal. They would direct their possessions towards the wing before picking a cross in or near the box. When the ball was possessed by Navas, Nacho, or Vallejo, they constantly looked for Kroos or Modric. The two CM’s were indicated to find their advanced full-backs. In the image above, Kroos is about to find Marcelo, who has loads of time and space to run at. Both images show parts of Madrid’s possession strategy. The first image shows how much space Asensio is granted after Marcelo tempts Pizarro out of position. 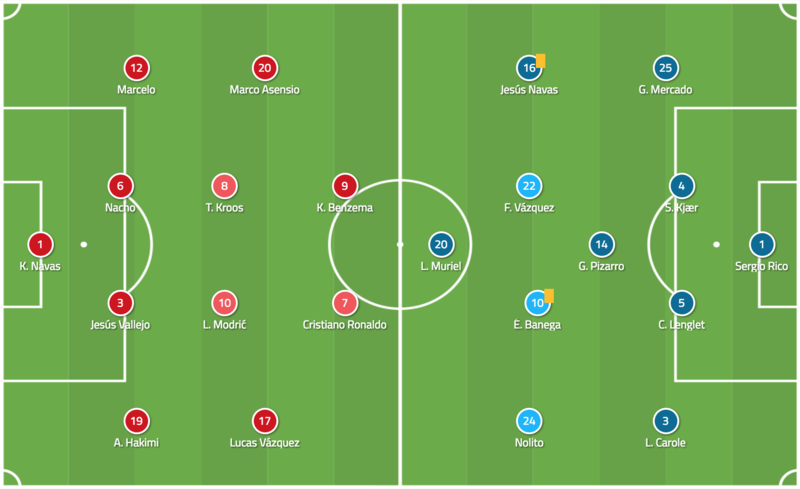 The second, how this disbalance created numerical equality for Real Madrid in attack, and also how RM constantly overcame Sevilla’s narrow full-backs. After reaching a crossing situation upon outpacing Mercado, Asensio places a pinpoint pass to Vazquez. The right midfielder then performs a fantastic shot that was saved by the GK. This was Real Madrid’s basic possession strategy to create chances against a weak Sevilla side. They easily overcame the visitors’ high-press, conducted fast transitions, and found their crossing targets centrally. Although simple, this strategy was greatly effective for the home side. In most cases, Sevilla’s midfielders and defenders ended up turning the ball over do to a scarcity of passing options. The image below illustrates Asensio’s instant press after Ronaldo misplaced a pass into Mercado’s feet. Real Madrid did this very often. By directly running at the ball possessor and then performing a vertical press after the initial player passes to another (other player located vertically parallel), they successfully cover 2 rivals with 1 player. Here is Real Madrid asphyxiating Sevilla’s options in their own half. As previously explained, ‘los blancos’ either man-mark or screen any possible passing option. Kroos, same as Asensio, successfully covers 2 men with 1 press. A few seconds after the previous image, Sevilla gave the ball away by attempting to find an advanced player in Real Madrid’s half. Real Madrid’s high-pressing strategy succeeded, as they forced a turnover by sticking to their approach and ultimately reached one of their possible desired goals, to invite Sevilla to play long. As stated in the previous section, Real Madrid regularly marked every player in Sevilla’s half. This constantly resulted in the away side giving the ball away in their own half. 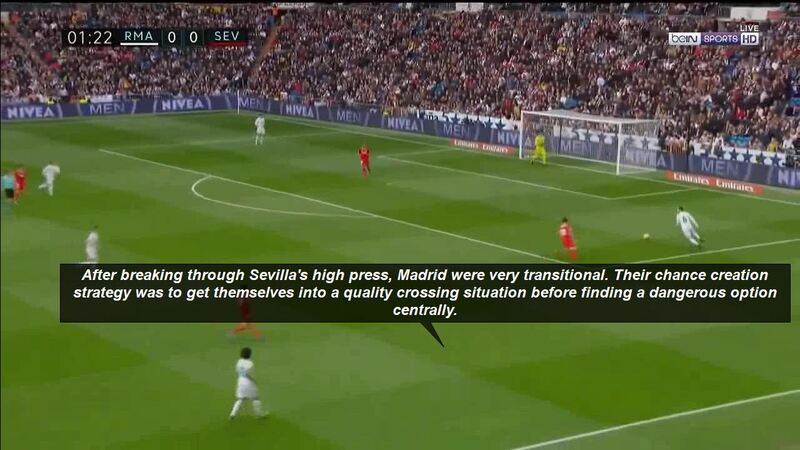 Upon happening, Real Madrid looked to create scoring opportunities off their possession strategy: to transition quickly before finding space behind Sevilla’s narrow full-backs. Upon doing so, they crossed to a central option. The image below shows the exact moment where Asensio is about to win the ball off of Pizarro’s misplaced touch. After a clever press, Asensio held possession for a couple seconds before finding Vazquez. The right midfielder, observing a projecting Hakimi, holds the ball enough to give the Moroccan some time. After retaining possession while still advancing, Vazquez finds Kroos. The German successfully finds Hakimi with a millimetric pass (the ball is just above the white line). In the end, Hakimi misplaced his cross to Benzema. This is the way Real Madrid successfully created chances after winning the ball back in Sevilla’s half. Although the final execution failed in this play, these tactics were extremely effective at breaking down Sevilla’s defense after they turned the ball over. The first half ended with a staggering 5-0 lead for Zidane’s men. Obviously, after that, there was no coming back for Sevilla. Real Madrid basically crushed them via a stretched out build-up, quick transitions, effective crosses, and great pressing strategies against a side who simply had no real approach in possession. Goals were scored by Nacho, Ronaldo (x2), Kroos, and Hakimi, who netted his first goal in a senior Real Madrid jersey. Although no conclusions could be drawn from the second 45 minutes of play, Real Madrid did have a slight shift in their mid-block strategy. During the first half, they deployed a 4-4-2 mid-block with a man-marking midfield and intense pressing from their wing players. In the second half, they went for a more zonal approach, while both central midfielders acted man-oriented based on the location of the ball possessor. 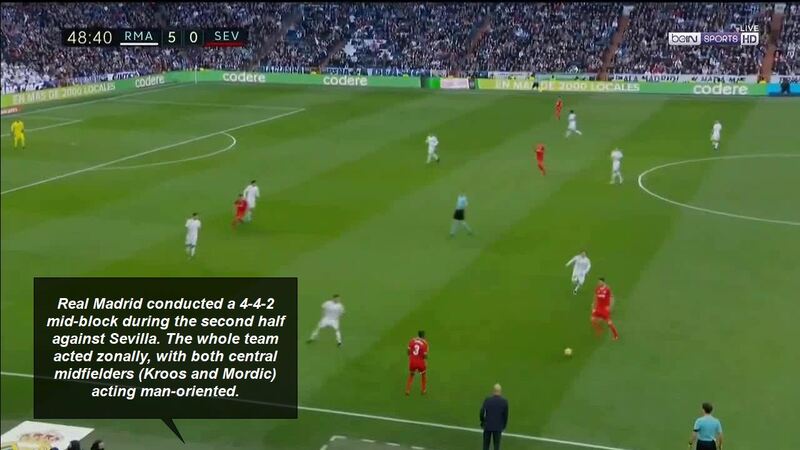 As the second image shows, Kroos and Modric used man-oriented positioning to create 4-man overloads on the wing. These trapped Sevilla’s possessions, with the final purpose of either forcing a turnover, or a backwards pass. 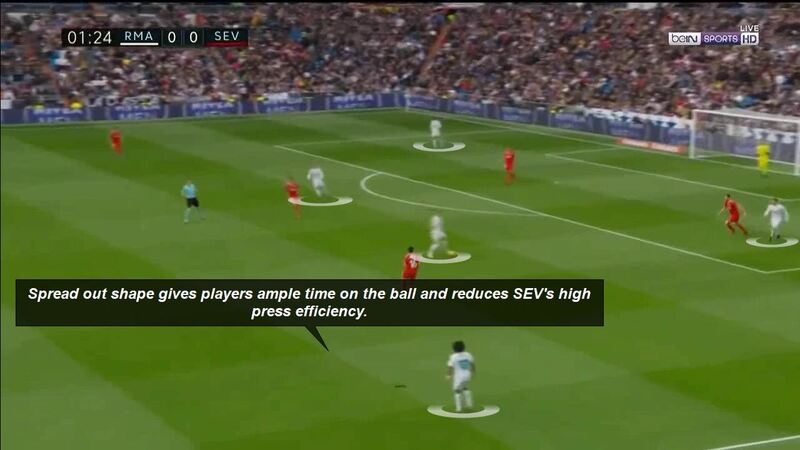 Madrid’s ultimate mid-block goal was to prevent SEV from progressing up the pitch through the central axis. Upon a switch of play from the visitors, Real Madrid approach their mid-block in the same fashion. Upon a pass to Sevilla’s possession orchestrator, Banega, Kroos prepares himself to press the Argentine. This often created a 4-3-1-2, since the man-oriented central midfielder was often pressing significantly higher than the other zonal midfielders. As shown, Kroos’ man-oriented marking is performed at an angle, tempting Sevilla towards the wing again. Aside from the German, Real Madrid’s double line of 4 was still zonally synchronized. After successfully redirecting Sevilla’s possession towards the wing, Real Madrid create the same 4-man overload on their left, as they did previously on the right. With these overloads, more often than not, they created numerical superiority during their touchline presses. In this case, it’s a 4v4. To help his team trap Sevilla towards the wing, Benzema stands in between the ball possessor and a potential backwards pass. Although not very elaborative, Real Madrid’s mid-block was fairly simple and effective. Of course, not much is needed to sustain a team when they are 5-0 down at half-time. The second 45 minutes, as previously stated in the previous section, allowed for few conclusions to be drawn. The first half, on the other hand, had most of the action and interesting tactics by the home side. The most interesting tactical variation was, by far, Real Madrid’s shift in their mid-block strategy. Their chance creation strategy remained the same during the entire match. Real Madrid completely dismantled Sevilla with fairly simple tactics. It was the effectiveness of their deliveries and decision-making when switching from their build-up to their transitions that made Sevilla break-down structurally. Sevilla made a mistake by playing with such narrow full-backs. It resulted in a 2v1 with either Asensio/Marcelo or Vazquez/Hakimi against Mercado or Carole respectively. After overcoming the rival full-backs, Madrid created chances in an orthodox way, via crosses. 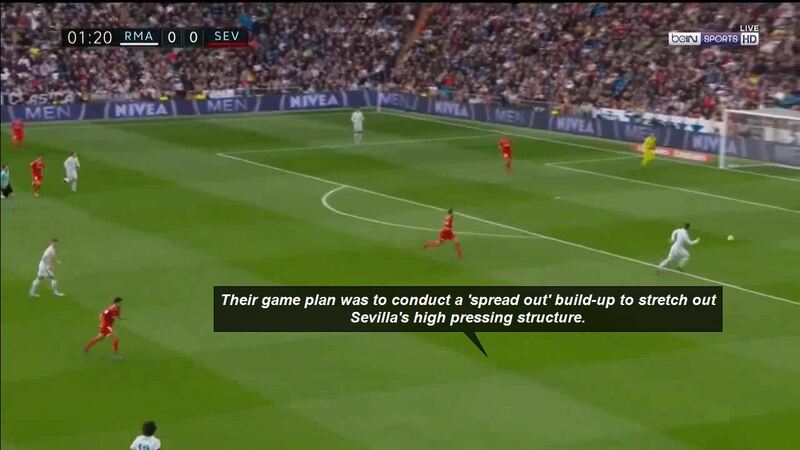 It’s safe to say Sevilla’s game plan, in every aspect of the game, was very poor. They lacked defensive composure, a true mid-block and high-pressing strategy, a compact low-block, and a proper possession strategy to create chances. Can Real Madrid continue this form onto the rest of their season? I believe not. While they will certainly improve during the second half of the season, Sevilla’s null tactics and gameplan were a HUGE factor in the outcome of the match. Real Madrid have rarely created so many chances with such ease, and they did so with fairly simple tactics. Nonetheless, this could be the start to their uprise this season. Only time will tell.